The historic Arroyo Seco Bank Building sits at the northwest corner of York and Figueroa Streets, in the rapidly gentrifying neighborhood of Highland Park, in northeastern Los Angeles. Designed in 1926 by John C. Austin — the same architect behind the iconic Griffith Observatory, Los Angeles City Hall, and Shrine Auditorium — the building feels very much a part of old L.A. on the outside. 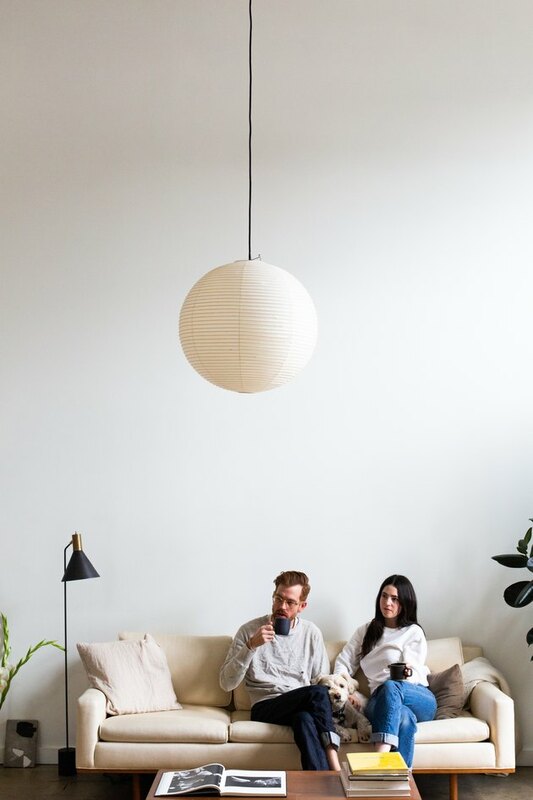 That's partially what drew Julia Saltzman and Austin Leis, who both work in design, to the loft they now call home. Leis had been to the building many times before, visiting friends. 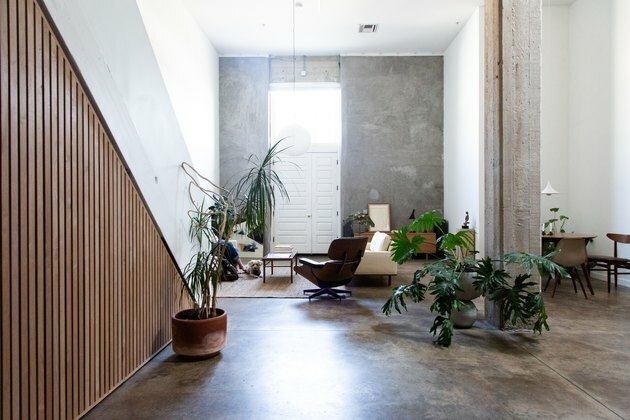 "Every time I came over for dinner or to grab a drink, I always found myself so infatuated with the building," he says. "I'd always leave telling myself, 'You've gotta live here at some point.'" In 2011, the bank building was renovated and converted into residential units, as well as artist studios and now "has this wonderful feeling of creativity flowing through it," he says. When the opportunity to actually move in arose, it wasn't exactly love at first sight. The walls of the available unit were painted a Dijon yellow, and while other units they'd seen had floor-to-ceiling windows, this one had one large window above the door and a skylight toward the back — But that turned out to be a boon. "Now that we've settled in I couldn't imagine living anywhere else," says Saltzman. 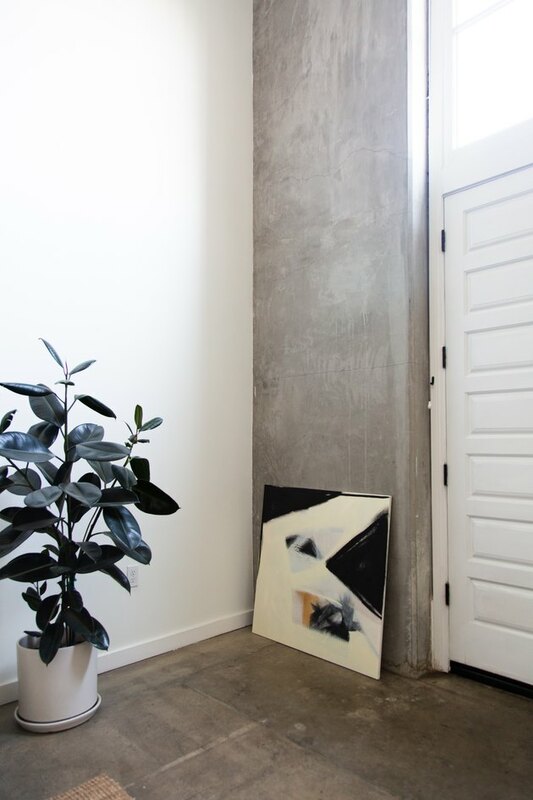 "The light plays games on our walls throughout the day creating an evolving mood." Only six months in, they've repainted, pulled out the carpet, refinished the stairs, and added custom storage (to remedy the primary drawback of the loft's wide-open living space). The place feels bigger, they say, and more elegant. There are key design pieces — in particular, lighting and seating. (In Leis' spare time, he's developing a small line of furniture and light fixtures.) And while some details are still left to do, the couple are more than OK with their timeline. "Making a home yours takes time," says Leis. "Sometimes it happens quicker than others, sometimes it doesn't. I think it should be an organic process and if the results aren't happening as fast as you'd like, give it time and take a step back for clarity, and readjust." 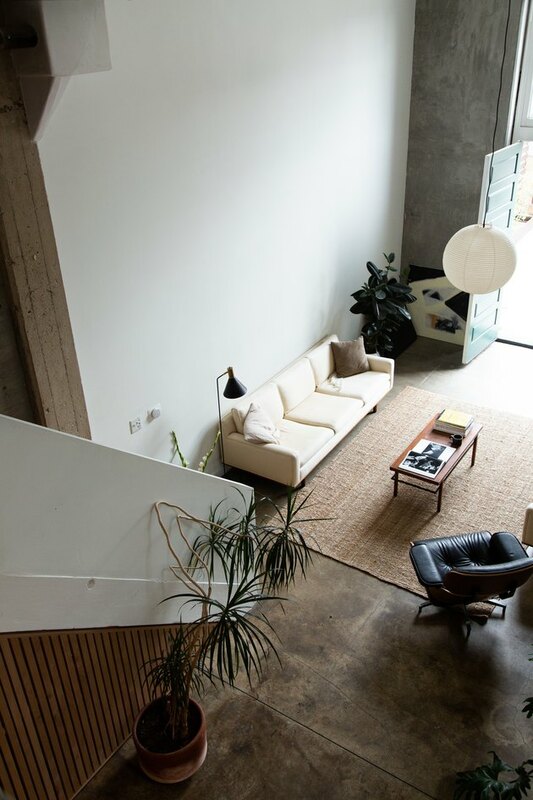 "My favorite thing to do when we have people over for a party is to sneak upstairs and watch everyone chat and enjoy themselves in the living room from up above in the loft," says Leis. 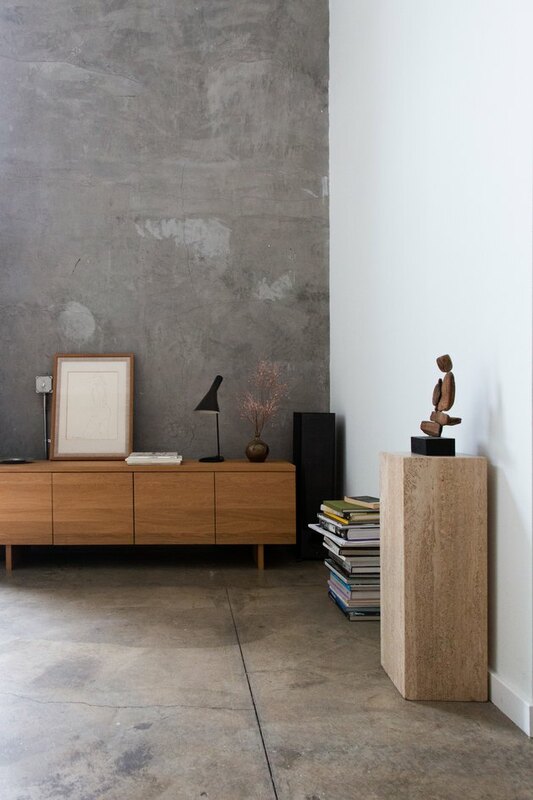 Iconic design pieces punctuate the loft, including this hanging Noguchi lamp. There's another Noguchi in the bedroom. 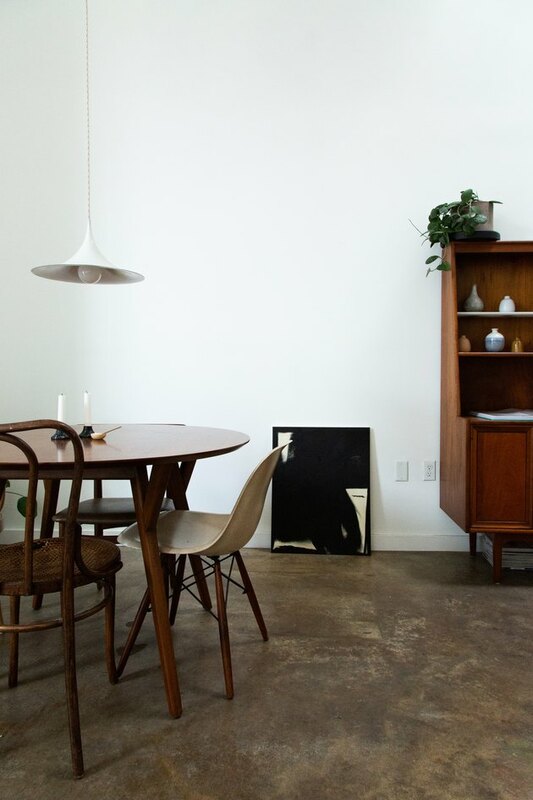 A Thonet bentwood chair, Eames Shell Chair, and a Josef Hoffmann armchair surround the dining table. 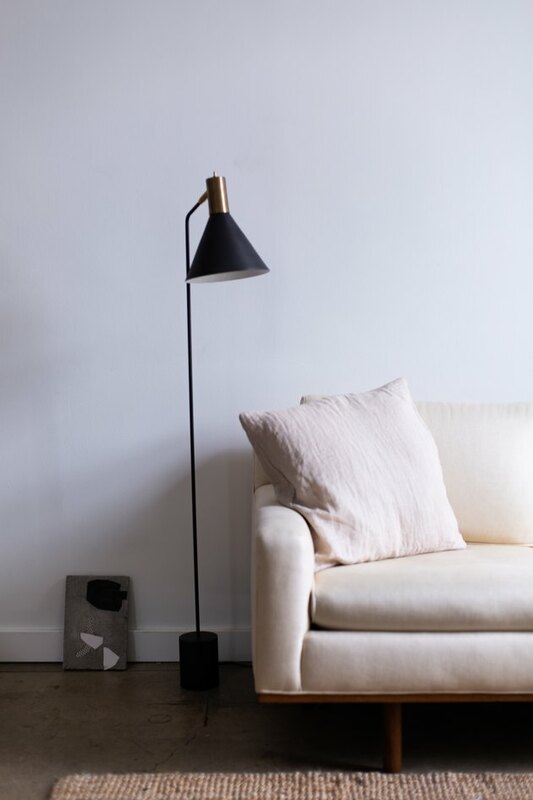 The reading floor lamp in the living room is by Atelier de Troupe, the design studio where Leis works. They specialize in handmade lighting and furniture. (The ceiling lights in the kitchen and sconces in the bathroom, not pictured, are also by Atelier de Troupe). Light pours into the loft from a skylight. 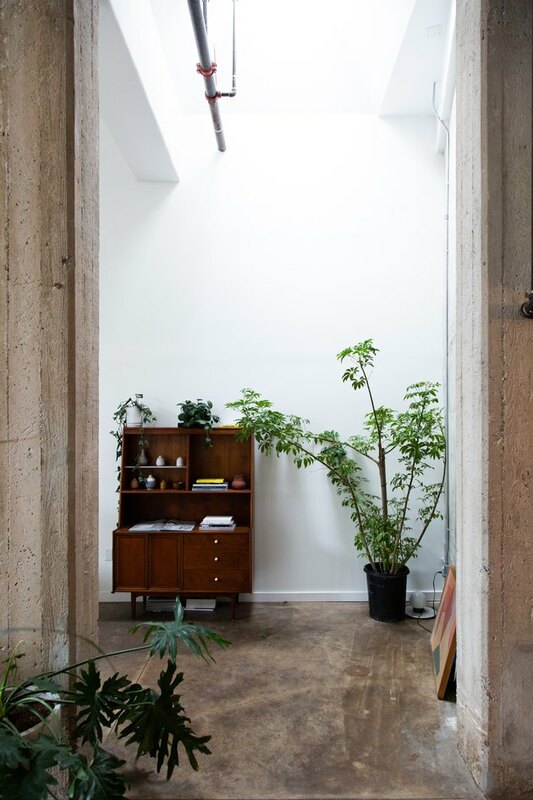 Plants and art help soften the space, in addition to other design elements. 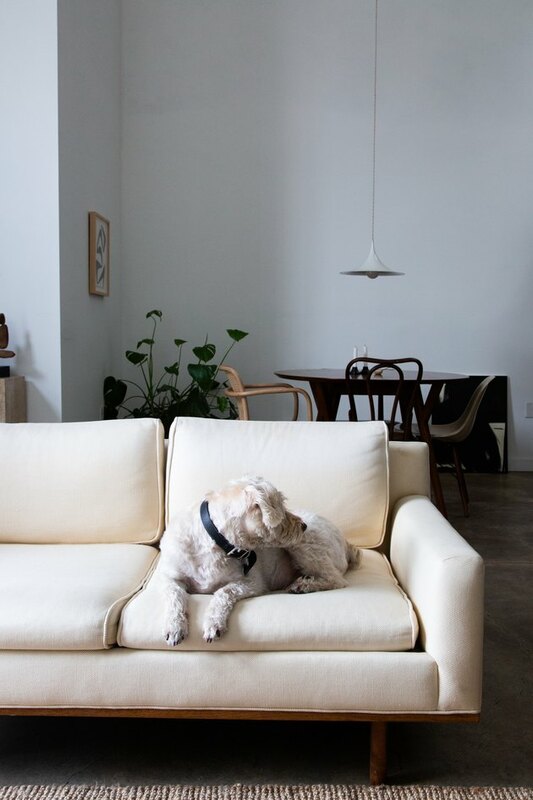 "No matter how much concrete, stone, or glass our home has, it will always be filled with warmth through our furniture and lighting," says Saltzman. 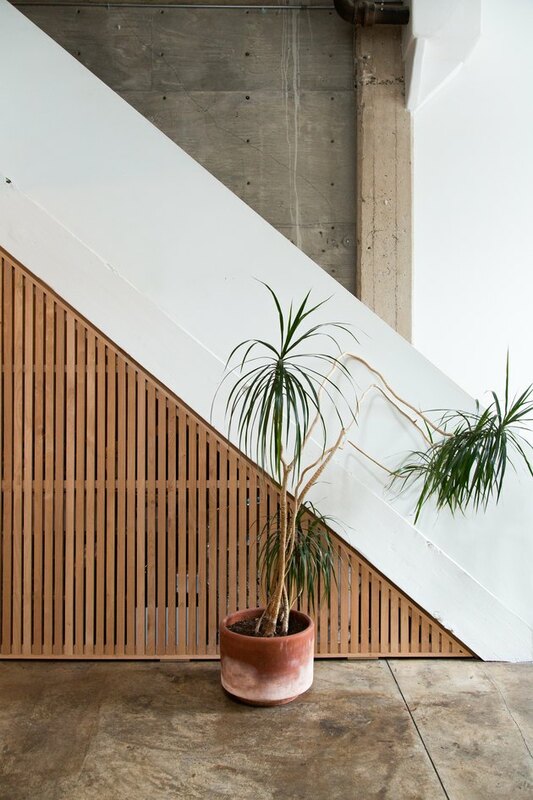 "The Dracaena in the terra-cotta planter next to the staircase is one of my favorites," says Leis. "It's over 30 years old and there's something special to me about it." 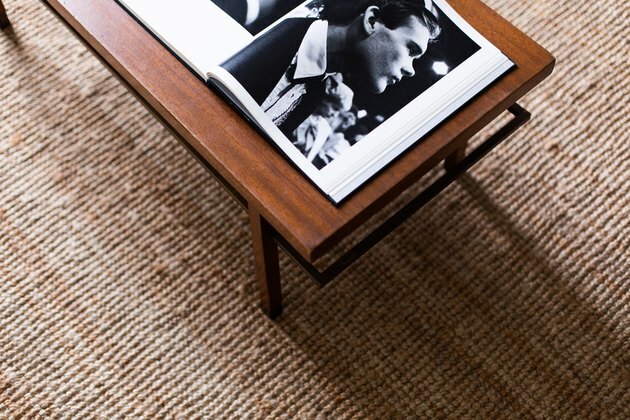 "A jute rug is a great way to make a space look elevated without breaking the bank," says Saltzman. 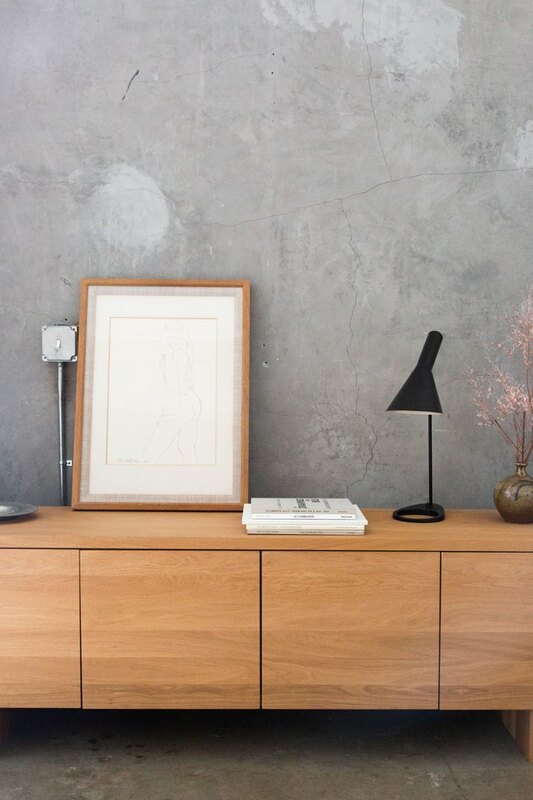 The white oak credenza is from Muji. Atop the travertine pedestal is a sculpture by Saltzman's grandfather, called Poised. "My grandfather was an artist," says Saltzman, "and his works are scattered around our home from paintings to sculpture." 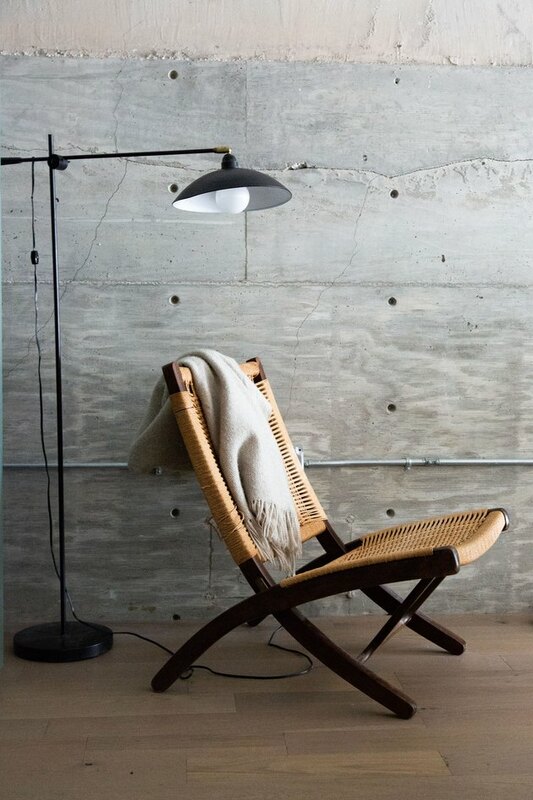 Saltzman inherited the vintage Hans Wegner chair from her grandparents. "We both believe in classic design over trends, so we've settled on pieces that we will have forever instead of just in the moment," she says. Creating storage space was a top priority. 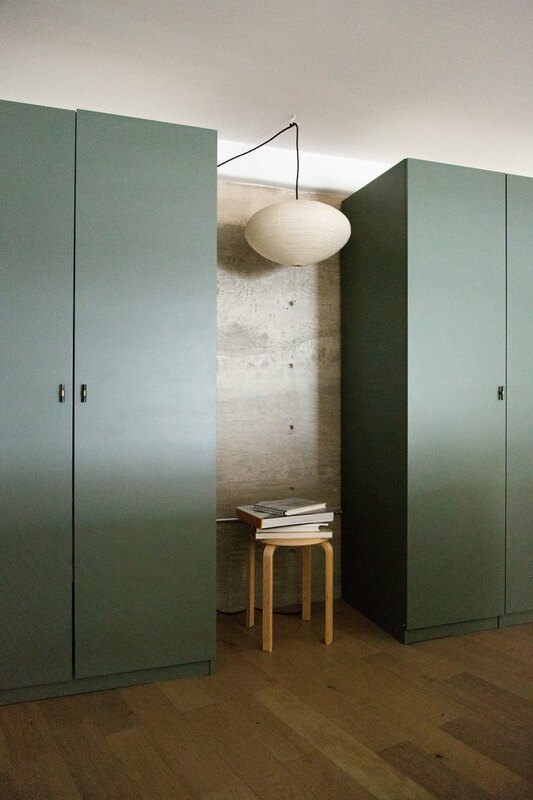 "We ended up buying the PAX system from IKEA and painting over them with Farrow & Ball Smoke Green and installed horn handles from CB2 to make it feel more custom," says Saltzman. 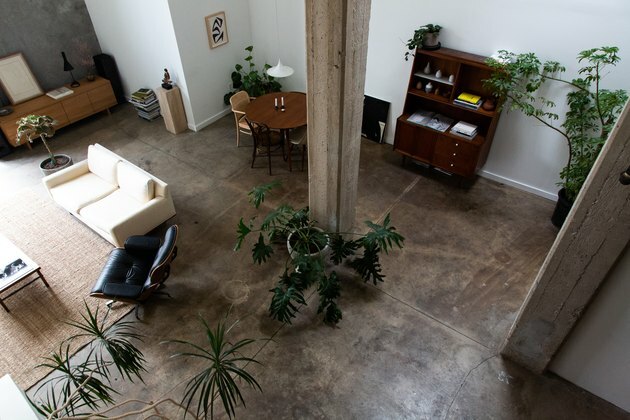 Taken as a whole, the loft feels carefully considered. "I always told my friends I wanted my home to look like a museum but with things you could actually touch," says Leis.